Shortly after US Ambassador Nikki Haley revealed that Russia would be slapped with a third round of sanctions on Monday for "enabling the Syrian government's use of chemical weapons in civil war," Russian President Vladimir Putin said that further attacks on Syria by Western forces, "in violation of the U.N. Charter," would send international relations into "chaos." 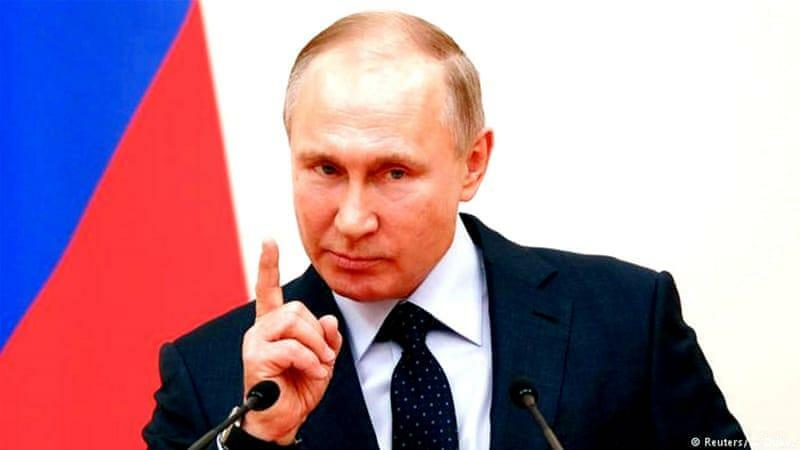 The US-led strike was denounced by Putin as an "act of aggression," and a "war crime" by Iran's Supreme leader Ayatollah Khamenei. The United States, France and Britain launched over 103 missiles on Saturday night at three Syrian facilities in retaliation for a suspected poison gas attack in the city of Douma seven days prior. While the West has conclusively blamed the Assad government for the attack, serious questions have arisen over everything from Assad's motive, the type of nerve agent used, to the credibility of the first responders - an NGO known as the White Helmets who have a reputation for staging evidence. France cited social media posts and YouTube evidence as justification for their participation in the strikes. The French services analysed the testimonies, photos and videos that spontaneously appeared on specialized websites, in the press and on social media in the hours and days following the attack. So "it looked real and went viral" is apparently all France needs before launching a military strike on a sovereign nation. 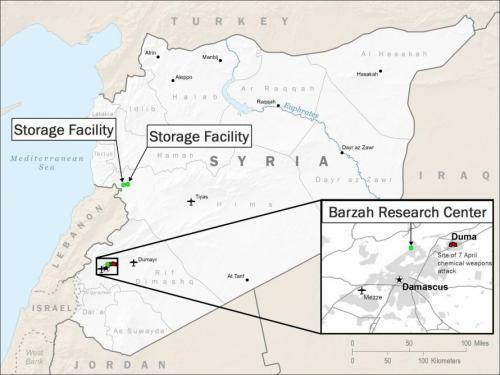 The Barzeh Research and Development Center - hit with 57 U.S. Tomahawk Land Attack Missiles (TLAMs) and 19 joint air-to-surface missiles, which the Pentagon's Marine Lt. Gen. Kenneth F. McKenzie Jr. says will "set the Syrian chemical weapons program back for years." The Him Shinshar chemical weapons depot, - was struck by nine U.S. Tomahawk Land Attack Missiles (TLAMs), eight Storm Shadow missiles, three naval cruise missiles and two Scout land attack cruise missiles, according to NPR. The Him Shinshar chemical weapons bunker facility - located over 4 miles from the chemical weapons depot, was hit with seven Scout missiles. The third strike was on a command center. Of the more than 103 cruise missiles fired, Syria claims it intercepted 71 using soviet-made missile defense systems. Many in the international community have raised concerns that there simply is not enough evidence to conclude who conducted the April 7 chemical attacks - with China even stating "The arrogant US has a record of launching wars on deceptive grounds." And as we first reported last week, Germany (along with Italy) refused to be an active member of the strikes. "This is not the role that we - in coordination with our partners - want to play in this conflict,” said Germany's Foreign Minister, Heiko Maas - followed a statement by Angela Merkel reading "We support that our American, British and French allies, as permanent members of the UN Security Council, have taken responsibility in this way" ... just not enough to take part in the strikes. Following the strike, President Trump proudly tweeted "mission accomplished," despite U.S. Lieutenant General Kenneth McKenzie of the Pentagon acknowledging that elements of the chemical weapons program remain, and he could not guarantee a future attack by Assad. As Reuters notes, Israel backed Saturday's air strikes by Western powers (five days after their own strike on Syria's T4 airbase). “Israel fully supports President Trump’s decision to act against the use of chemical weapons in Syria,” Israel's Prime Minister Benjamin Netanyahu told his cabinet in broadcast remarks on Sunday, adding that he had commended his British counterpart, Theresa May, in a phone call. In February, Israel intercepted and downed an Iranian drone approaching its northern border over Golan Heights, which the IDF said on Saturday was loaded with explosives and "tasked to attack." In response to the drone, Israel attacked Syria's T4 airbase for the first time this year, losing an F-16 pilot in the process. Russia and Syria called the Western missile strikes an act of aggression, though many have noted the attacks weren't really that devastating. Syrian President Bashar al-Assad even trolled the West - releasing a video titled "The Morning of Steadfastness" featuring him nonchalantly walking through a cavernous marbled hall with a briefcase, as if nothing happened. Hezbollah's leader in Lebanon, Sayyed Hassan Nasrallah, said on Sunday that the West's Saturday strikes on Syria had failed to achieve anything - "including terrorizing the army, helping insurgents or serving the interests of Israel." Nasrallah said the U.S. military had kept its strikes limited because it knew a wider attack would spark retaliation from Damascus and its allies and inflame the region, according to Reuters. “The American (military) knows well that going towards a wide confrontation and a big operation against the regime and the army and the allied forces in Syria could not end, and any such confrontation would inflame the entire region,” Nasrallah said. The heavily armed, Iranian-backed Shi’ite Hezbollah movement, allied with the Syrian army and represented in the Beirut government, has been a vital ally of Damascus in Syria’s war. Meanwhile, a UN draft resolution circulated by France, the United States and Britain late on Saturday aims to establish an independent inquiry into who is responsible for chemical weapons attacks in Syria - which might have been advisable before Donald Trump broke virtually every campaign promise and tweet over the last five years regarding Syria, for the second time.